In popular literature, Taj Mahal is known as an architectural symbol of love after the late Mughal Emperor Shah Jahan built this in memory of his favorite wife, Arjumand Banu Begum, popularly known as Mumtaz Mahal. It was recorded that the emperor was deeply pained and he mourned for a long time after Mumtaz died. He even refused to engage in any court festivities, postponed the wedding of his sons, and frequently visited the temporary resting place of his wife before the construction of Taj Mahal was completed. Taj Mahal is located in Agra, India. The reigns of the father, Akbar in 1542 to 1605; the son, Jahangir in 1605 to 1627; and the grandson, Shah Jahan in 1628 to 1658 in the Mughal rule were recorded as the golden age of Muslim architecture in India. They made a record in the history of their cultural achievement which showcased the complex building projects highlighting the empire’s richness, placidity, and stability. Also, the establishment of the School of Painting recalls the great accomplishment of King Akbar in the line of arts. Marked by its originality in the Islamic world, this endeavour produced notable Muslim paintings during his reign. King Jahangir embarked on large construction programs. Following his father’s footsteps, King Shah Jahan promoted both the calligraphy and painting during his reign. In addition, King Jahan’s court displayed the magnificent collection of jewels. 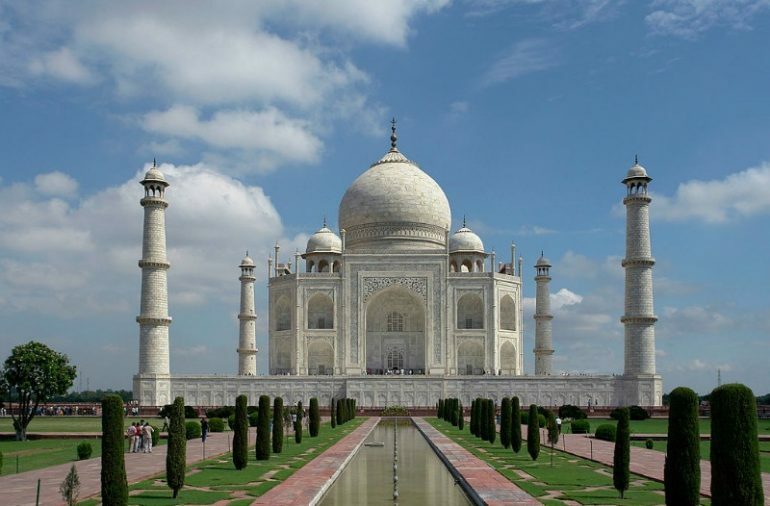 A Taj Mahal (crown palace) masterpiece climaxed his reign which shows both the expression of architectural splendour and his deep love for his wife, Mumtaz Mahal. The Taj Mahal is unique in its monumental scale, stunning gardens, lavish ornamentation, and its overt use of white marble. The concept of creating Taj Mahal is based on the Humayun mausoleum which was built for Sayid Muhammed, Akbar’s father. It has a geometrical layout inspired by Persian quadrate plan featured in numerous Safavid gardens. One of its features is the mausoleum standing magically at the northern part alongside Jumna River which gives a picturesque view from near and afar. Its view is kept clear and unblocked from any spot in the garden. A total of 22,000 skilled people worked in the construction of the entire Taj Mahal complex namely the stonecutters, inlayers, masons, carvers, painters, dome-builders, calligraphers, and other artisans hired from the entire Iran and Central Asia. The Taj Mahal displays the integrated and blended architectural components of Islamic Asia (Iranian features), Indian features, and the Central Asian features. The decorations were also inspired by the prominent Muslim decorative arts such as geometry, calligraphy, and floral forms. The decorations symbolically mean love, peace, and paradise as it is displayed by their choice of size, color, and texture. The overall Taj complex contains five major elements to include the Masjid (mosque), Rauza (main mausoleum), Naggar Khana (rest house), Bageecha (gardens), and Darwaza (main gateway). It has a total of 42 acres land area and 50 meters aloft the riverbank, standing on the square platform is found mainly the Taj Mahal tomb. For its landscape, the side part of Taj Mahal has red sandstone buildings, and on the west part situates the Mosque balanced with a guest hall on the east part. According to historians, the mosque in Taj Mahal served as the proper staying place for the emperors who wants to visit and other guests who wants to pray. The entrance gate is another featured element of Taj Mahal. 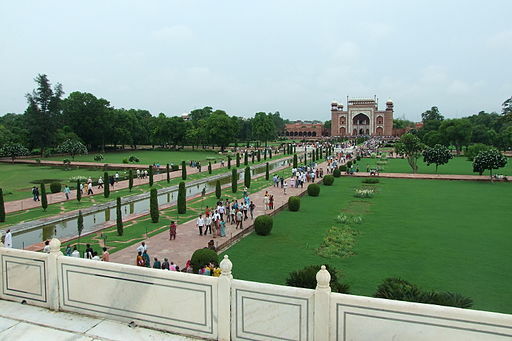 It is made up of red stones and magnificent structure that can be seen in the south complex connected towards the gardens.